Heat oven to 375°F. Remove rolls from bag; thaw 10 minutes. With thumb, make indentation in center of each roll. In medium bowl, mix cheese, sundried tomatoes and olives. Place 1 tablespoon cheese mixture in each indentation. Place on ungreased cookie sheet. Bake 12 to 17 minutes or until tops are light golden brown. Serve with marinara sauce. 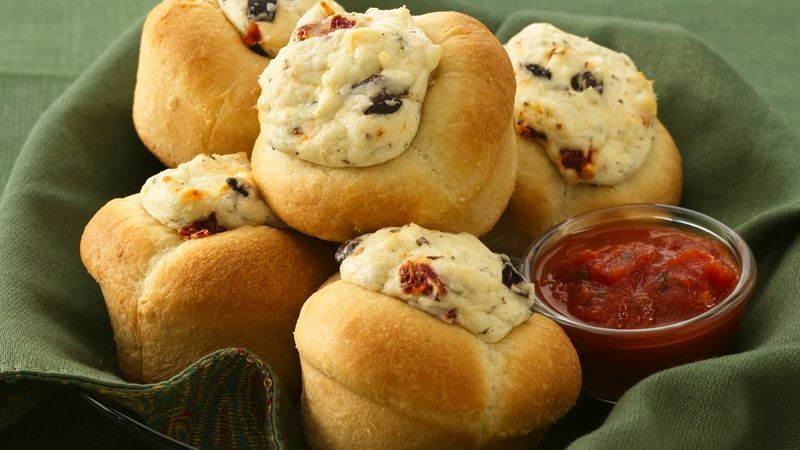 Keep a bag of Pillsbury® frozen dinner rolls on hand; you can use some in a recipe such as this, and keep the remaining rolls frozen, so you're ready to pop them in the oven to make dinner extra-special. Tuscan Spinach and Tomato "Crustini"